A description of Occacock Inlet : and of its coasts, islands, shoals, and anchorages, with the courses and distances to and from the most remarkable places, and directions to sail over the bar and thro’ the channels adorned with a map, taken by actual survey, by Jonathan Price. Occacock was heretofore, and still retains the name of, an island. It is now a peninsula; a heap of sand having gradually filled up the space which divided it from the bank. It continues to have its former appearance from the sea; the green trees, that cover it, strikingly distinguishing it from the sandy bank to which it has been joined. Its length is three miles, and its breadth two and one half. It is the only one which admits vessels of any burden, bound to any of the ports of entry or delivery of the State of North Carolina, excepting those on Cape Fear river and those of Beaufort and Swannsborough. …dwelling-house and its out-houses, which are commodious, here are ware-houses for a large quantity of produce and merchandize, a lumber yard and a wharf, along side of which a number of vessels are constantly riding. These late improvements contribute much to the usefulness of the establishment, and give it the appearance of a trading factory. A notary public’s office is kept here. Close-up of Shell Castle, just inside Ocracoke Inlet, as depicted on Jonathan Price’s Occacock from Actual Survey, 1795. Upper left, A north View of Gov’r Wallace’s Shell Castle & Harbour North Carolina, from the collection of the North Carolina Museum of History. Upper right, panoramic view of the Shell Castle transfer print. There are several additional examples of the above Shell Castle transfer print in private hands. If someone has one for sale, please use the “What’s on your mind?” comment box below to contact us. The above quote was in reference to a chart of the NC coast published by Price and Strother in 1798. However, it also illustrates the purpose of Price’s survey and description of “Occacock.” John Gray Blount had drawn a rough sketch of Ocracoke Inlet in early 1794; he sent it to Thomas Blount for the latter’s use in promoting Shell Castle as a site for a lighted beacon. John Gray Blount then assigned to Jonathan Price the task of creating a more formal map/chart of Ocracoke by actual survey, and of writing an attractive description. 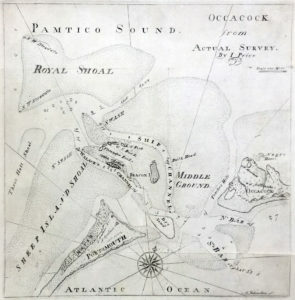 The 1795 map of “Occacock” was drawn by Jonathan Price from his own surveys, engraved by New Bern silversmith William Johnston, and printed in New Bern by Francois Xavier Martin. As such, it was the first map drawn, engraved, and printed in North Carolina. Occacock from Actual Survey was a well-executed map by Price. 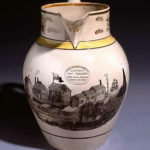 The engraving quality was sufficient for its purpose, but certainly not up to the standards available in Philadelphia at the time. The local silversmith in New Bern was likely chosen for expediency and economics, though that is pure conjecture. Information pertaining to the timeliness and cost of the engraving and printing is not available. Only two extant copies of the “Occacock” pamphlet have been located. The State Archives in Raleigh has the pamphlet with map. The Duke University Library possesses an example of the pamphlet, lacking the map. In addition to the State Archives, one extant copy of the map (without pamphlet and with a New York provenance from the early 19th century) is known. If you confirm the survival of other copies of the map and/or pamphlet, please let us know via the “What’s on your mind?” comment box below. The pamphlet was reprinted in the October 1926 issue of the North Carolina Historical Review, available on line via this link. It is also available for download as a pdf through JSTOR. Image courtesy of the John Carter Brown Library Map Collection. The above chart was also engraved by the New Bern silversmith, William Johnston. It was thought by many, when this place was first improved, that the neighboring element would soon assert its right, and wash away the castle; but since the great storm in August, 1795, which hardly did any damage to it, their fears have vanished. Unfortunately, the “neighboring element” did assert its right eleven years later. 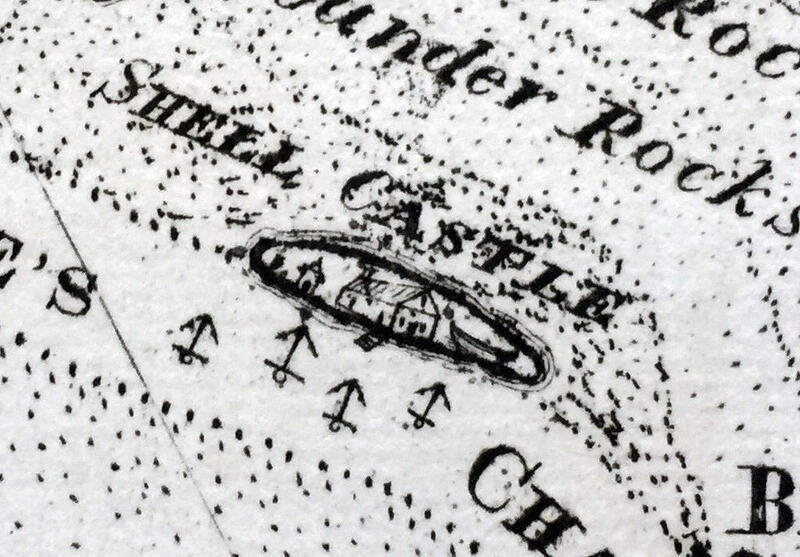 Two hurricanes in 1806 caused severe damage from which Shell Castle never fully recovered. Jonathan Price was at Shell Castle when the second hurricane made a direct hit. Although Price survived both hurricanes, he lost most of his notes and equipment for an updated coastal survey he was performing that year. By the War of 1812, the channel had shifted away from Shell Castle and maritime commerce shifted to nearby Ocracoke and Portsmouth. MCGUINN, PHILLIP HORNE. Shell Castle, A North Carolina Entrepôt, 1789-1820: An Historical and Archaeological Investigation. M.A., ECU, 2000. 452 pp. Unfortunately, it has not been made available on line. 2018 Update: McGuinn’s thesis is NOW AVAILABLE ON LINE. *Ok, time for a confession for benefit of the purists out there. Occacock from Actual Survey was not the first map printed in North Carolina. 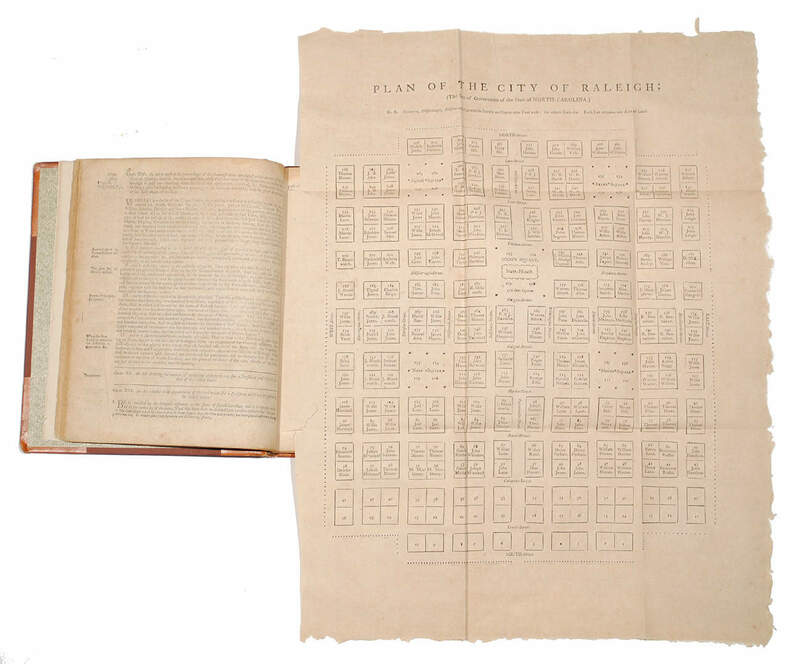 That distinction goes to a Plan of the City of Raleigh, also printed in New Bern by F. X. Martin, and first published as a separate in 1793. However, that rather unsophisticated plan was pieced together by typesetting; it was not printed from an engraved plate. An image, courtesy of the antiquarian map firm of Cohen & Taliaferro, is available via this link. Help wanted: Energetic hard-working individuals capable of providing corrections or additions to the above information. Submit application via the “What’s on your mind?” comment box below. • Dunbar, Gary Seamans, “Historical Geography of the North Carolina Outer Banks” (1956). LSU Historical Dissertations and Theses. Accessed 22 September 2017 at http://digitalcommons.lsu.edu/cgi/viewcontent.cgi?article=1166&context=gradschool_disstheses. See digital page 292 of 301 (original text page 281) for a chart showing historic inlets on the Outer Banks. • Mallinson, David J., et al, “Past, Present and Future Inlets of the Outer Banks Barrier Islands, North Carolina”, (2008). Department of Geological Sciences, East Carolina University. Accessed 22 September 2017 at http://www.ecu.edu/cs-acad/icsp/upload/PastPresentAndFutureInletsDec2008.pdf. Digital page 10/28 has a nice chart showing not only documented historic inlets, but also previously undocumented inlet channels discovered using ground-penetrating radar data. The author is indebted to Philip Howard of Ocracoke for providing this information and clarification. Philip lives on Ocracoke Island and writes a blog (https://villagecraftsmen.blogspot.com/) about daily island life, history, and traditions. This entry was posted in 18th Century, Map Advertisements, NC Transportation and tagged F.X. Martin, Fracois Xavier Martin, John Gray Blount, John Wallace, Jonathan Price, Occacock, William Johnston by crmaps. Bookmark the permalink. very interesting that shell castle…. just as a side note…. Wills dad, I believe, is a professor at Washington and Lee in Lexington Va.
and I didn’t know, and hadn’t had a chance to ask Will himself since I signed up for this blog, if there was any connection. Is it possible to purchase a facsimile or copy of the Price map of 1795? I’m writing a novel set on Shell Castle and Portsmouth, and I’d love to have a copy. You seem to have a great deal of info on Blount and Wallace — I’ve tried in vain to obtain dissertations from ECU on Shell Castle — I’d appreciate any help you can give me. 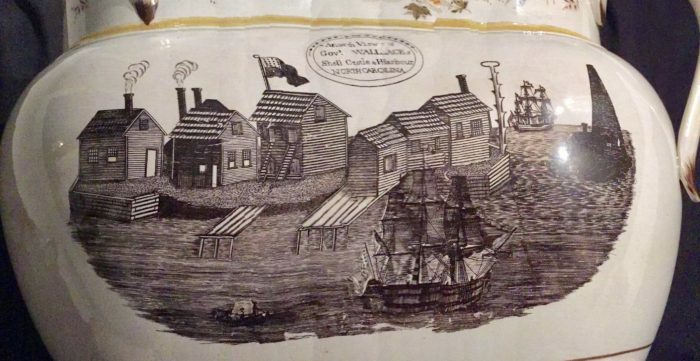 The State Archives in Raleigh has a high resolution TIFF of their copy of Jonathan Price’s 1795 “Occacock” map. I do not know why it has not yet been added to the NC Maps web site. I live on Ocracoke Island and write a blog (https://villagecraftsmen.blogspot.com/) about daily island life, history, and traditions. 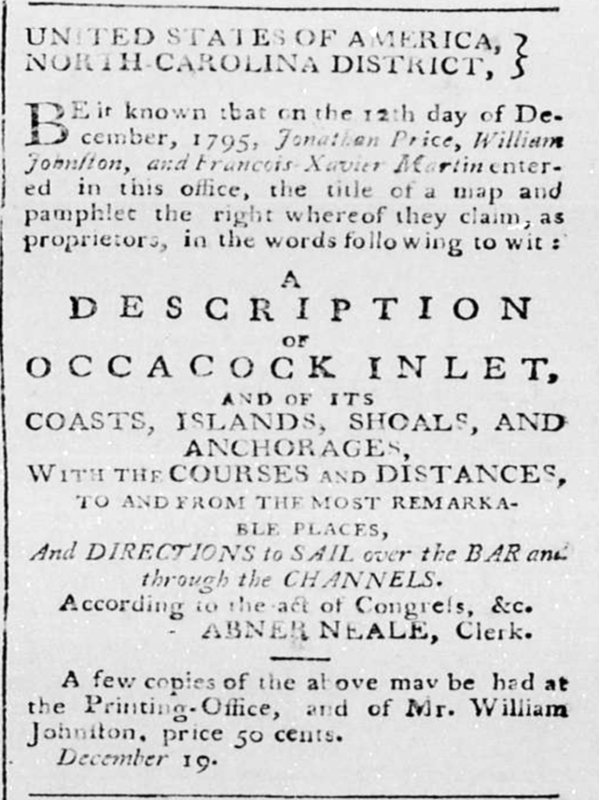 When I first learned of Price’s “Description of Occacock Inlet” I was puzzled by the sentence you quote in this post (“Occacock was heretofore, and still retains the name of, an island. It is now a peninsula; a heap of sand having gradually filled up the space which divided it from the bank.”) In what sense had Ocracoke, heretofore an island, become a peninsula, I wondered. I believe I now understand that sentence, and it differs from your explanation. Of course, it is possible there was “a continuous sand bank peninsula that extended all the way north to Virginia.” New Currituck Inlet would qualify as the northern limit of the Banks; Caffeys may have formed after 1795; Crow may not have existed in 1795; Roanoke may have been closed in 1795; and New Inlet, because it is “periodic,” may not have existed in 1795. Knowing the dynamic nature of the Outer Banks I find it difficult to believe no other inlets (other than Ocracoke) existed at the time of Price’s writing. I remember older islanders talking about “Nigh Inlet,” which periodically cut Ocracoke Village off from the rest of the island. Even as late as the 1970s and early 1980s the area between the edge of the village and the National Park Service Campground was a tidal flat that periodically flooded during high tides. If I am correct, and sea levels continue to rise, the area of Ocracoke Village will, in some distant future, form a cape, and eventually become offshore shoals. An explanatory note: As sea levels rise the Outer Banks “migrate” to the west as sand is swept over the islands during storms. A more stable inside island would not migrate. Thus, the “sandy banks” will eventually bump up against an inside island, merging the two. Thanks to Philip’s input, an error in the original post has been corrected. Corrections are greatly appreciated. One more comment on Price’s description of Occacock: After writing that Occacock “continues to have its former appearance from the sea; the green -trees, that cover it, strikingly distinguishing it from the sandy bank to which it has been joined,” he adds, “Its length is three miles, and its breadth two and one half.” That description corresponds very closely with both the appearance and approximate size of Ocracoke village today.